Dr. Dmitry Alden, a liver cancer and pancreatic cancer surgery specialist, spearheads a highly specialized liver & pancreas surgery practice dedicated exclusively to surgery of the liver and pancreas. His teams dedicated approach to cancer treatment has given new life to his patients. Dr. Alden performs more pancreatic surgeries a year then most other surgeons. Scientific studies have demonstrated that surgeons performing more than 14 pancreatic surgeries a year have superior results with their patients. Having such extensive experience enables Dr. Alden’s team to operate on patients with the most advanced pancreatic tumors that require vascular resections and reconstructions. Dr. Alden’s Whipple procedure mortality is less than 1% and our rate of postoperative complications is extremely low. This has been accomplished by creating a dedicated team working under a highly experienced, well-trained, and compassionate surgeons. Patients and medical professionals from American (and around the world) seek out Dr. Alden’s specialized best in class individualized cancer treatments and services including his expert surgical management of the patient’s unique condition. Dr. DAlden specializes in taking exceptional care of each patient from the initial complimentary consultation to the post-operative period. The honor and privilege of caring for patients comes with the responsibility and dedication of the Surgeon’s staff to the utmost standard of excellence in patient care and final surgical outcome. In addition to office based consultations, Dr. Alden offers remote consultations to patients and medical professionals anywhere in the world via phone or SKYPE. Dr. Alden and his team perform a large variety of liver operations, from simple removal of liver tumors to highly complex biliary (bile duct) and vascular reconstructive surgeries including: Whipple Procedure and Distal Pancreatectomy. Dr. Alden uses a variety of minimally invasive approaches to control liver tumors. Radiofrequency ablation (RFA) is one such tool. Dr. Alden routinely perform pancreas surgeries for liver metastases and primary liver tumors using various radiological techniques to allow the liver to grow, should one of the lobes be too small to support the patient after a major operation. Previous experience and extensive training in liver transplantation allows Dr. Alden to apply these techniques to fight the most advanced liver cancers and secure safe outcomes. 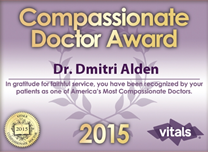 Dr. Alden’s philosophy is to tailor the operation to the individual patient’s needs. In other words, Dr. Alden and his team are not treating a picture on the CT scan or MRI, we are focusing on a patient’s specific needs, down to concerns about cosmetics of the postoperative scar. Dr. Alden has gained widespread experience and global recognition in minimally invasive liver and pancreatic surgeries. He performs many of our pancreatic and liver resections using the da Vinci robotic system or laparoscopy (minimally invasive techniques), leaving practically no scars. Most of the surgeon’s patients are discharged home within 24-48 hours after operations performed using these techniques, regardless of the size of the tumor or the complexity of the surgery performed.